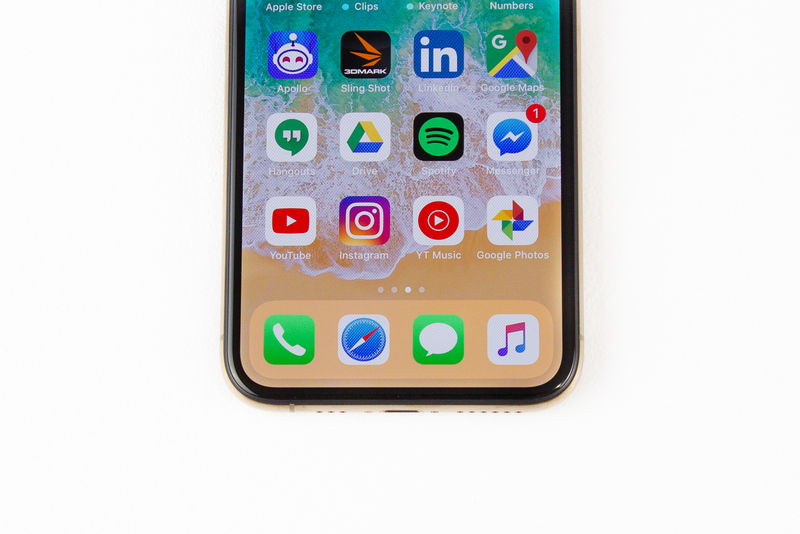 The iPhone XS is easily the best iPhone to date, and may even be one of the best smartphones on the market. With a vastly refined processor and a better camera, its performance gives the best Android phones a run for their money. Unfortunately, the fact remains: though it nails all the important features, it’s just too expensive to be compelling against other flagship phones. Unless you’re a die-hard Apple fan, look into other options before pulling the trigger on this one. I vividly remember watching Steve Job’s historical presentation at MacWorld 2007 in my middleschool computer class. “An iPod, a phone, and an internet communicator. An iPod, a phone, and an internet communicator!” he repeated on stage. Once the attendees realized that he was describing a single device, the auditorium exploded in laughter and applause. In that blissful atmosphere of excitement and surprise, the iPhone was born. Nine generations later, and the iPhone is almost unrecognizable from the first. But Apple’s reputation persists. 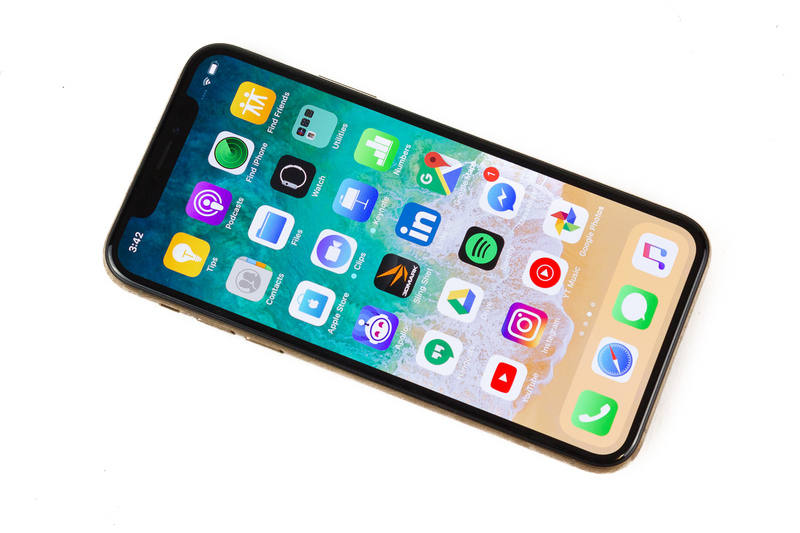 The iPhone XS, an incremental update to the iPhone X (pronounced “ten”), is the latest phone that everyone loves to hate. Described with one word, the iPhone XS is…smooth. The glass front and rear are joined together by a rounded stainless steel band. When I held it in my hand, the entire phone seemed to seamlessly flow from the front to the back. While expertly crafted, it’s hard to say how well the stainless steel band can resist scratches and bumps. Considering its glossy finish, any imperfection would be instantly apparent, so throw on a case or handle with care just to be safe. The glass back is also premium. Apple claims that this is the most durable glass yet, but doesn’t give details on how durable it actually is. Is it harder? More impact resistant? Regardless of how much better it is, careful handling is still advised. The metal sim tray has a thin rubber band to seal the opening. Though the device is rated for IP68 dust and waterproofing, I would still avoid dunking it under water frequently. Water damage automatically voids the warranty even if you’ve purchased extended Apple Care. 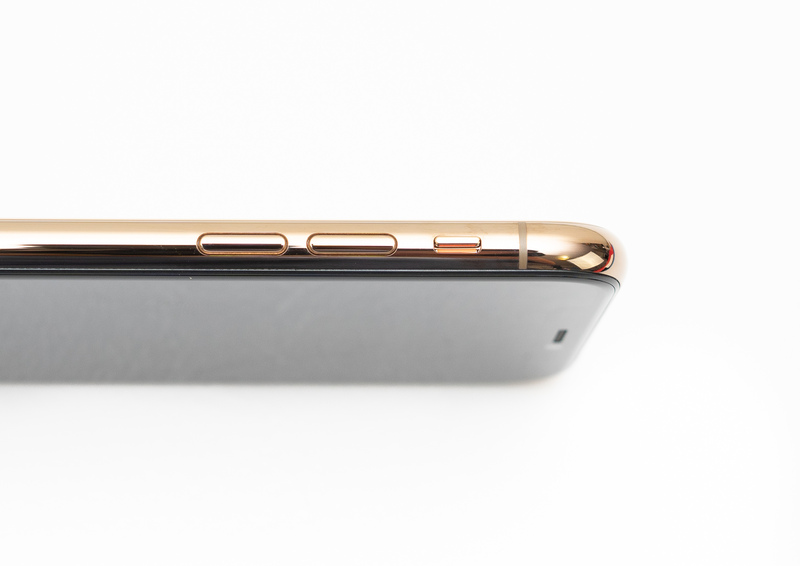 The iPhone XS has a protruding vertical camera array. This can be annoying if you’re trying to lay it down flat without a case as it wobbles intensely, especially on trains and flights. There are two grills at the base – one for speaker and the other for the mic. 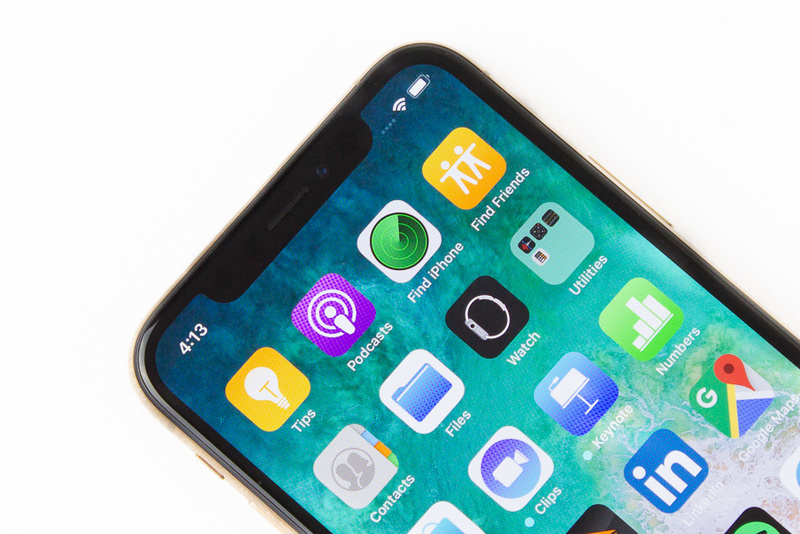 In landscape position, the iPhone XS generates stereo audio by firing sound from the bottom right grill and the earpiece. Volume levels were perfectly balanced, which is something other phones, like the Google Pixel 3 XL, struggled with. A Lightning port sits between the two grills. Apple, please make this the last generation of iPhones without USB-C. It has recently been integrated into the iPad Pros, though, so that’s at least a hopeful step in the right direction. Hoping for the headphone jack to return, however, is futile. Apple is the first company to remove the headphone jack from its flagship phones and it’s as good as dead on iPhones. 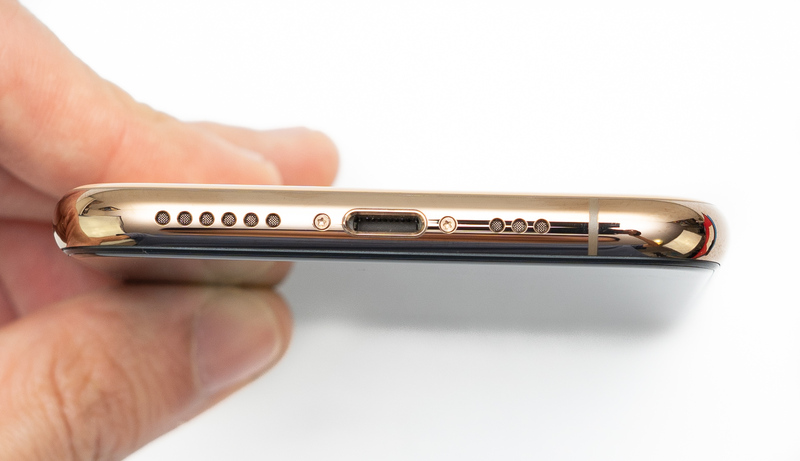 Because the iPhone XS uses a Lightning port, USB-C headphones don’t work with it either. If you have legacy high-end analog earphones, you either must invest in several adapters, or buy wireless headphones. In its infinite generosity, Apple has included USB-C headphones in the box. I’d really like to see some adapters thrown in, too. One great feature of the new iPhone is the notification mute switch above the volume buttons. One flick, pure silence. So simple yet so useful. Modern phones are obsessed with minimizing screen bezel, but the persistent bottom chin has proved to be difficult to kill. Normally, the height of the bottom bezel is limited by the size of the display’s power connector. This imposes a hard limit on how thin the bottom bezel can be. With the iPhone X, however, Apple has folded the connector back and under the display, finally bringing the chin in line with the rest of the display. 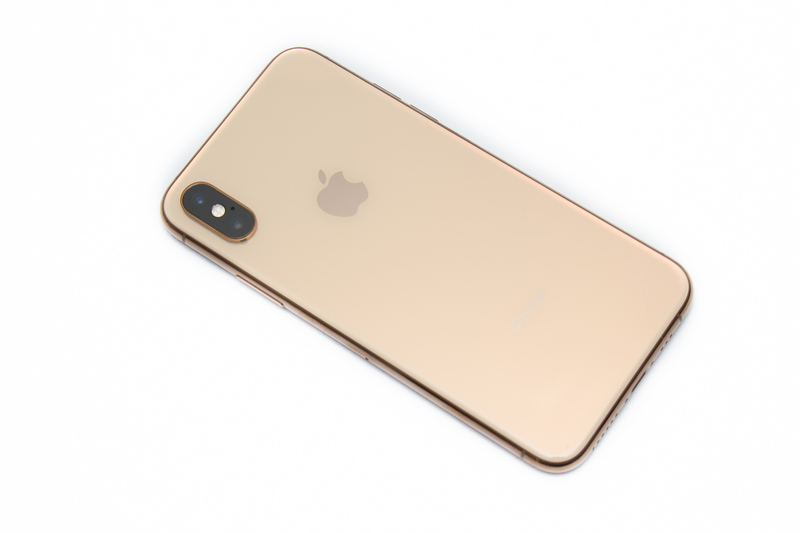 Believe it or not, this seemingly simple idea took tons of R&D and is actually a big part of what makes the iPhone XS so expensive. The iPhone XS essentially employs an identical screen as last year’s iPhone X. It’s the same 5.8” 2436 x 1125 Super Retina HDR OLED panel. As with most OLEDs, it’s got beautiful contrast. At 458ppi, details are sharp, too. Off-axis viewing is great; there’s no colour distortion even when viewed in near parallel with the display. In addition, it’s one of the few phones on the market that’s Dolby Vision compliant. That means more content at higher HDR quality. The True Tone color-correction feature is supposed to maintain color consistency across in various lighting scenarios. But in colder lighting like the halogen bulbs, it applies a reddish tint and makes the display seem overly warm. If this was an Android phone, the ultra-wide notch would leave little room for the notification area. But since Apple doesn’t rely on each app’s unread badges, this isn’t an issue. Though I would’ve liked to see it without a notch, its shallow height doesn’t dip too much into the screen. The iPhone XS sports two 12MP sensors at the rear. One for wide angle with an f/ 1.8 aperture, and one for telephoto with an f/ 2.4 aperture. Both cameras are optically stabilized for better handing in longer exposure shots. Upgrading from the iPhone X to the iPhone XS gets you a 30 per cent larger wide-angle camera sensor (40.6mm2). By retaining the same 12MP resolution as the iPhone X, its pixel size has been increased by 0.2 micrometers. Larger pixels capture light more efficiently, so the iPhone XS should be even more capable in low-light than its already fantastic predecessor. Apple’s new Focus Pixels – a fancy name for its phase-detection autofocus – has been reworked as well. There are now many more phase-sensing pixels, which is why the iPhone XS touts 13 per cent faster focus seek time. Live mode is enabled by default, which takes a short burst of pictures and presents them in a timeline so the photographer can select the best result. The new 7MP f/ 2.2 TrueDepth front camera brings adjustable depth-of-field to selfies. While it attempts to make selfies more interesting, its low resolution and terrible edge detection seriously hamper the final image. I was surprised to see the simulated aperture blurring out everything but my face. The extremely fast and accurate Face ID is a double-edged sword. It’s great in that it unlocks the phone in a flash, but dangerous in that anyone can hold your phone up to your face and approve an Apple Pay transaction. Thankfully, Apple lets you disable Face ID authentication and use a PIN instead. The iPhone X doesn’t have a dedicated low light mode. It seems like Apple is quite confident that its camera is capable of distinguishing the scenes. All test images are taken using the standard shooting mode. The iPhone’s portrait mode allows the user to adjust the depth of field after the picture has been taken. 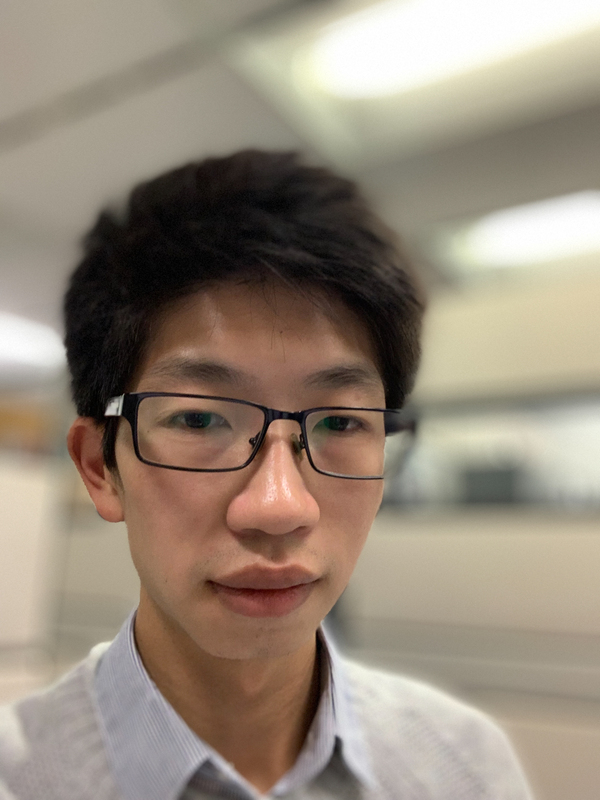 In contrast to the front camera, depth-of-field in portrait mode using the rear camera is much more reliable. 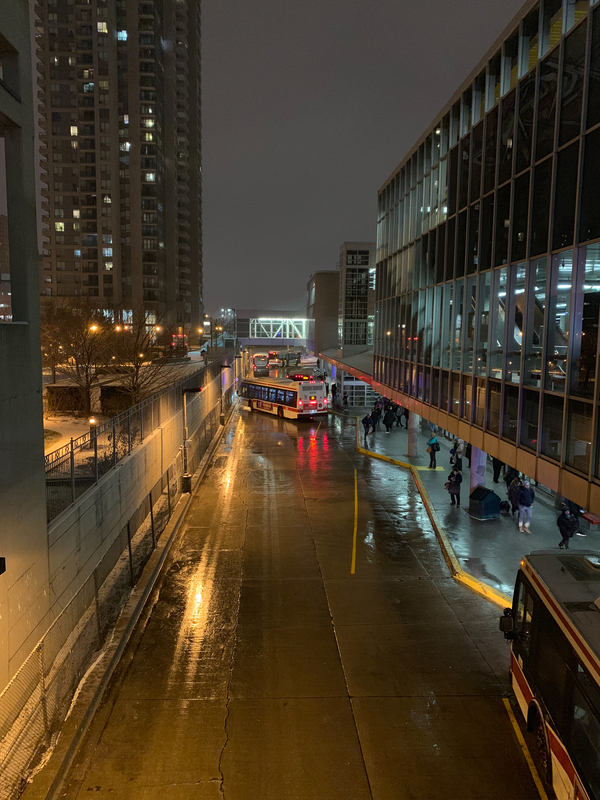 iPhone XS’s default camera app doesn’t have a manual mode – something the amateur photographer in me sorely miss. It does, however, feature a plethora of post editing settings. 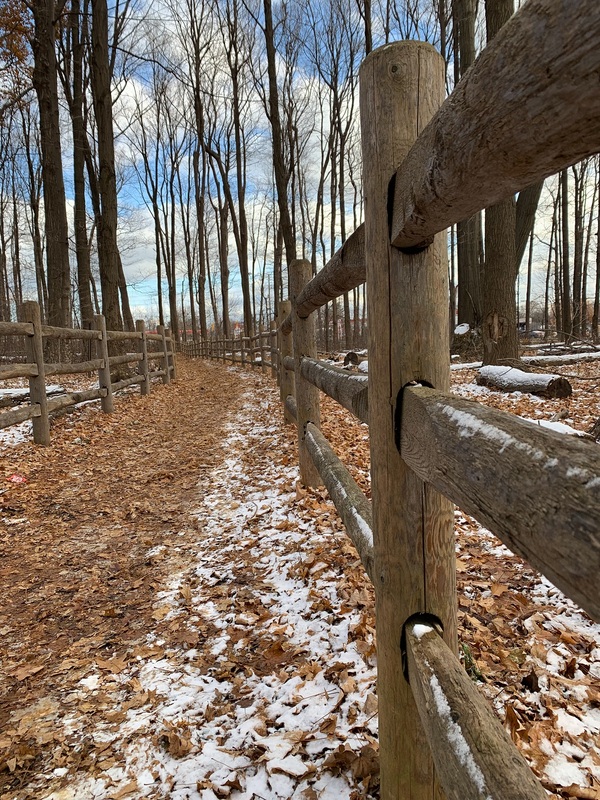 If you think about it, this makes sense for a smartphone: post editing focuses your attention on composition instead of fiddling with settings. As long as the scene is good, you can fix the blemishes later. The new Apple A12 Bionic system-on-chip brings a bevy of refinements over the A11. Though its design the same, the A12 Bionic uses TSMC’s new 7nm transistors. The new node could explain how Apple achieved 50 per cent higher energy efficiency on its four smaller “Tempest” cores. In addition, the A12 has an extra graphics core attached, as well as an improved 8-core neural engine. Though more is always better, the iPhone XS’s 4GB RAM never gave me anxiety. Apple has traditionally been excellent with RAM management, and the iPhone XS is no exception. Having tons of apps running in the background produced no stuttering, crashes, or other performance problems. 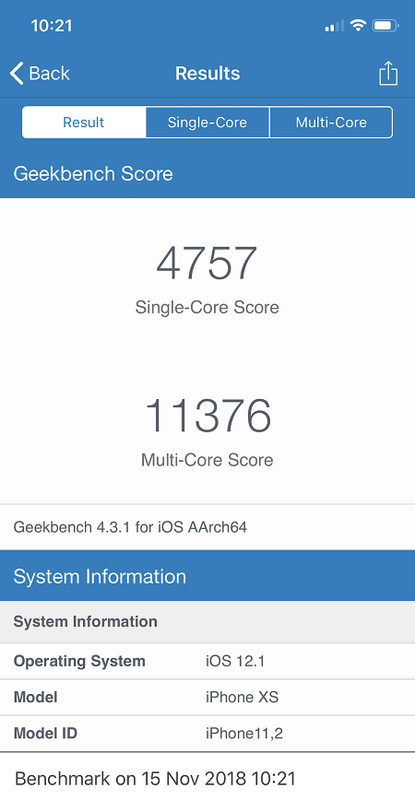 The A12 Bionic dominates Geekbench with the highest scores we’ve ever seen in a smartphone. At 4,757 in single-core performance and 11,376 in multi-core performance. 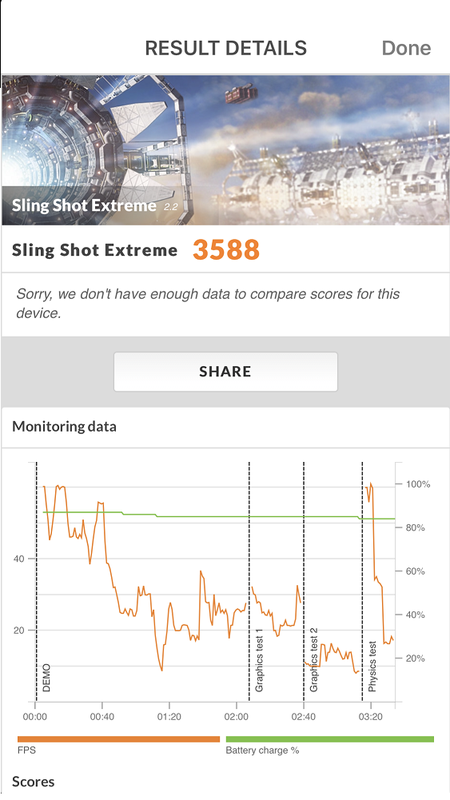 The A12 Bionic’s 3DMark score of 3,589 is high relative to other iPhones, but falls short compared to the Adreno 630 in the Qualcomm Snapdragon 845. The Google Pixel 3XL, for example, scored 4,681. It’s a bit harder to compare Apples to Apples here, however, as the iPhone’s score is based on Apple’s Metal API whereas Android uses OpenGL. PCMark Work 2.0 isn’t available on iOS, so productivity testing is solely based on personal use. My daily work routine consists of Google Photos, Google Docs, Trello, Gmail, Google Drive, and several other productivity apps. The iPhone XS has no problems with general productivity, as expected of any flagship device. Even with a multitude of apps open at once, the iPhone XS never had trouble juggling through them. After using a series of Android phones, befriending an Apple device was easier than I anticipated. Within a few hours, I was quickly acclimated to its well-structured settings menu and the beautiful, frosty interface. Apple remains adamant that it knows what’s best for its users, and that philosophy is sewn into the very soul of iOS 12. There’s little you can change about the way it looks and behaves. Don’t like all your apps splashed onto the screen? Want widgets on separate screens instead of piled onto one? Need a customized home screen? Tough luck, none of those options exist in iOS. But what I consider as annoyances, many consumers may not even care. In fact, it could even be beneficial for those who just want a phone to work from the moment they turn it on. Besides, it’s not completely devoid of customization. You can still replace its keyboard and change the quick launch menu and install custom ringtones. iOS actually lets you easily modify app permissions, which is not only helpful for hardening privacy and security, but also improving battery life. You can easily reduce system wakeups by disabling the app’s background refresh, or prevent unwanted data drain by disabling its cellular data access. Thanks to the natural gesture controls, I don’t miss on-screen navigations one bit. I love being able to slide on the bottom bar to switch between apps, or swipe and hold to view all open apps. Furthermore, the 3D touch feature opens context menus and a host of other functions when you hard press on an app. Combined with a haptics engine, navigating through iOS is not only painless, but enjoyable. Siri, Apple’s own voice assistant, has several strengths and shortcomings. 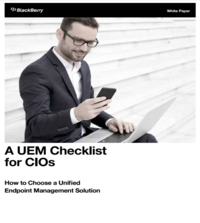 It excels at delivering results extremely fast, and voice recognition is dead-on most of the time. But while it can set calendar reminders and alarms without issue, it’s incompatible with some key apps in the meantime (Spotify being one of them). There’s also no continued conversation feature to questions, so it doesn’t understand follow up questions to a previous one. Face ID, the iPhone’s only biometrics sign-in method, works brilliantly. It has no problems capturing my face in dimly lit rooms. Not only does it scan your face, it’s also able to tell when you’re focused on the screen. This introduces some really cool features, like automatically expanding lock screen notifications when you glance over. Android has had split-screen for years. Apple, on the other hand, seems to have missed the memo that it’s a really handy feature. Split-screen is extremely useful for writing emails while referencing a web page or PDF file. This is the feature I missed the most from Android. Released a month before the new iPad refresh, the iPhone XS just missed out on getting Apple’s new T2 security chip. This, however, is likely a conscious choice on Apple’s part to reserve it as a feature in the next iPhone. The iPhone XS has a mediocre 2,658 mAh battery. This isn’t indicative of its true battery life, though, since Apple software and hardware run so efficiently together. Despite its smaller capacity, I was able to consistently squeeze out around five hours of screen-on time. The bundled 5W charger does the phone a great disservice. When a phone costs $1,379 before tax, it’s expected to have a quick charger. 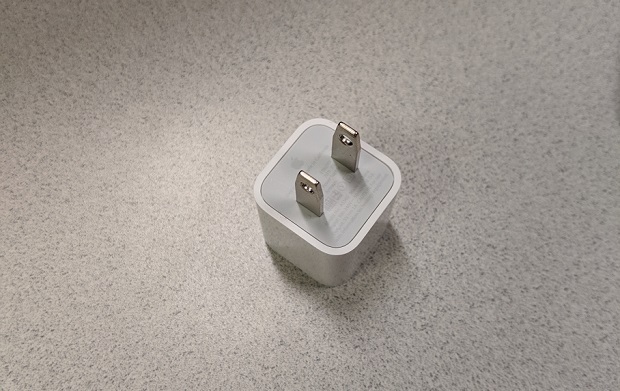 Instead, Apple forces you to shell out an additional $20 for a 12W charger, or $50 for a 30W charger. To give you an idea of how slow it is, it raised battery level by 20 per cent in 30 minutes. The Huawei Mate 20 Pro, on the other hand, charges to 70 per cent in the same period. The iPhone XS is so expensive that one may need a loan to buy it outright. The base model costs a whopping $1,379 for only 64GB of storage. Remember, you’re paying for the best Apple experience available rather than the best bang for your buck. In terms of value, there are more efficient ways to spend your money – and options are abundant. First up is the Google Pixel 3, the most directly-comparable Android phone. At $999, it’s $380 cheaper than the iPhone XS and comes with the highest-end specs available to Android phones. Compared to the iPhone XS, It trades off 0.4” of screen space for a larger battery, fluid stock Android, and arguably the best single-lens camera on the market. With specs like these, it’s hard to find a better all-around Android phone. Then there’s the Samsung Galaxy Note 9. Right off the bat, the Note 9’s commodious 128GB storage capacity is already much more appealing. It also wins with a stylus, 6GB of RAM, a 4,000 mAh battery, and a headphone jack. That’s in addition to its dual-sim support and excellent cameras. Huawei’s Mate 20 Pro is equally impressive. Its triple-camera array is the most flexible camera setup available. Though its Kirin 980 SoC can’t best the A12 Bionic, it edges out the iPhone XS with more RAM, twice the storage, and a colossal 4,200 mAh battery. While its EMUI is certainly bulkier than stock Android, it’s more than useable. Even packed with features, it’s still $180 cheaper than the base iPhone XS. Another option actually comes from the big-A itself. If its archaic design and worse display doesn’t turn you off, the iPhone 8 Plus still has the performance to keep pace in 2018. Its camera, though older, is still a capable shooter. I never thought I’d ever say this about an Apple product, but at $819, the iPhone 8 Plus is now a relatively cheap buy. The Apple iPhone XS is appealing in the same way that a Cadillac is. As the showpiece from one of the most premium tech companies, the iPhone XS exudes a pretentiousness that anyone would be proud to possess. 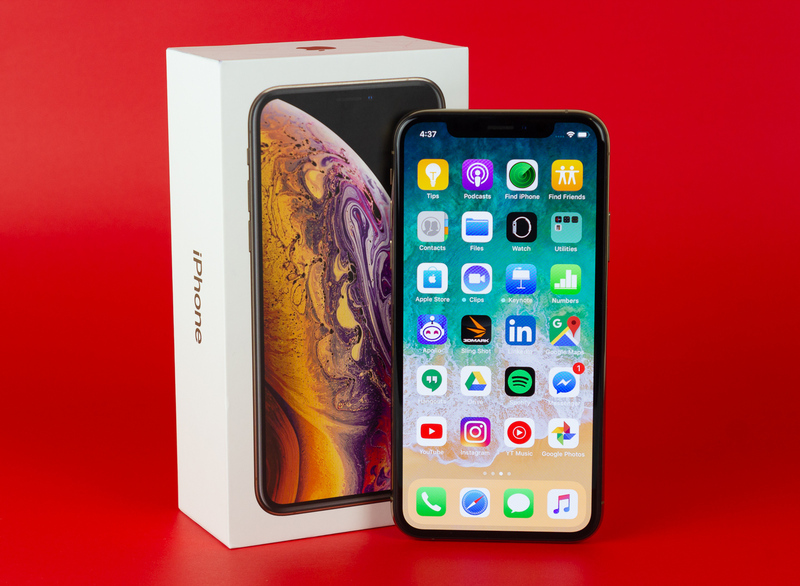 It has reasons to boast, too; equipped with a beastly processor, a stunning OLED display, and the best camera Apple has ever made, its quality is indisputable. Perhaps, then, it’s the same pretentiousness that drove Apple to price it out of the reach of most consumers, reducing its appeal relative to its competition.